It’s time to EXPLORE Bradford on Avon! We are thrilled to announce that our new tourism website is now live! The new site was commissioned by the Town Council to help attract more visitors to the town, replacing the previous site which was over a decade old. 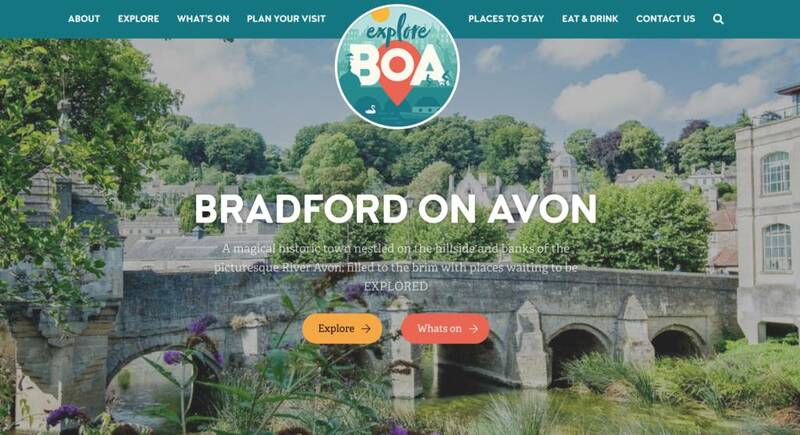 www.bradfordonavon.co.uk has been designed by local firm Boson Web incorporating the Council’s new tourist brand ‘Explore BoA’. We hope that the new look and website will broaden the visitor demographic and encourage visitors to discover more of what the area has to offer. Building on the work we have developed with our recent logo change, the website’s aim is to make the town’s online ‘shop window’ attractive, informative and responsive thereby encouraging those who might previously have stayed, dined or shopped elsewhere to consider Bradford on Avon as a great base from which to visit the wider area. The council also recently invested in joining the Great West Way route, and the hope is that tourists following this, will now have more reason to include BoA in their itineraries. The new website also includes an event calendar for the BA15 1& 2 postal area, which organisers in and around the town can submit event information to via the site or CLICK HERE. Local hospitality businesses are also invited to submit their details for free inclusion on the listings. 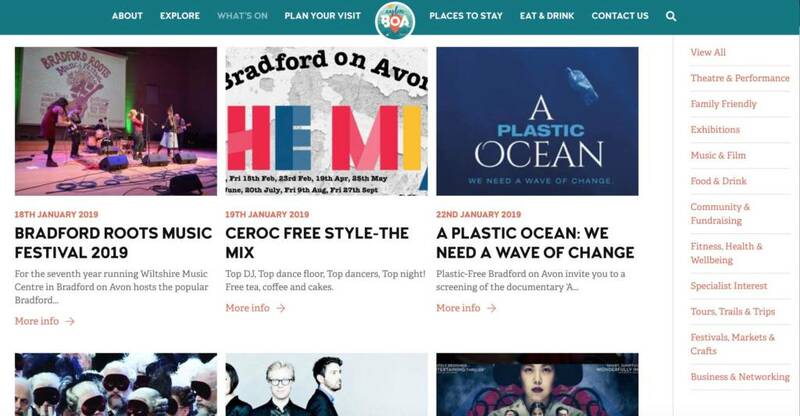 If you are a Food & Drink business owner in Bradford on Avon, and would like to submit your information click HERE – we have entered placeholders for businesses (which are set to rotate at random) and hope to hear soon from anyone wishing to take advantage of promoting their business to visitors. Both forms are also available via the site and registration is free with the option to upgrade to a premium listing if you would like to include more information/images. 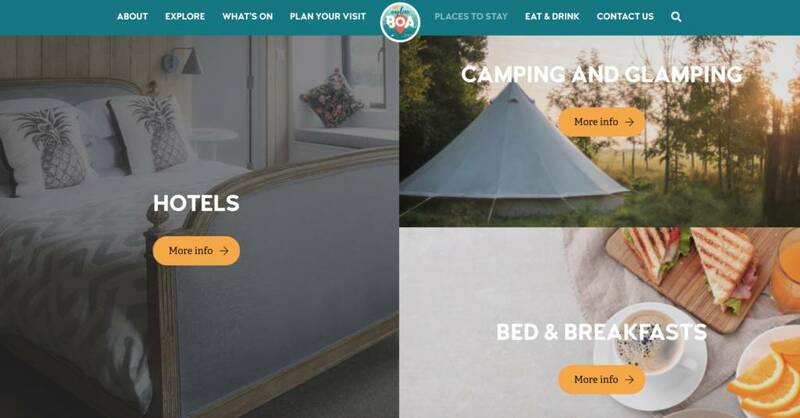 The new website is designed to be accessible to visitors, residents and to local businesses; we’re very keen for the site to promote events and are offering a free listing to organisers and local hospitality businesses. We also want to help residents and their guests to explore all that Bradford on Avon has to offer, in terms of activities and open spaces, and support our local traders – we know that money spent locally supports the town indirectly, and we want to see that market grow. Whilst the majority of the site content is complete, there are some sections which we will be working on over the next few weeks, so keep a look out for updates and thank you for your patience. Boson Web and the Town Council are now moving on to phase 2 of the project; to redesign the Town Council’s website to better accommodate the needs of users, the community and provide clear information. We hope to launch this site in the Spring 2019.